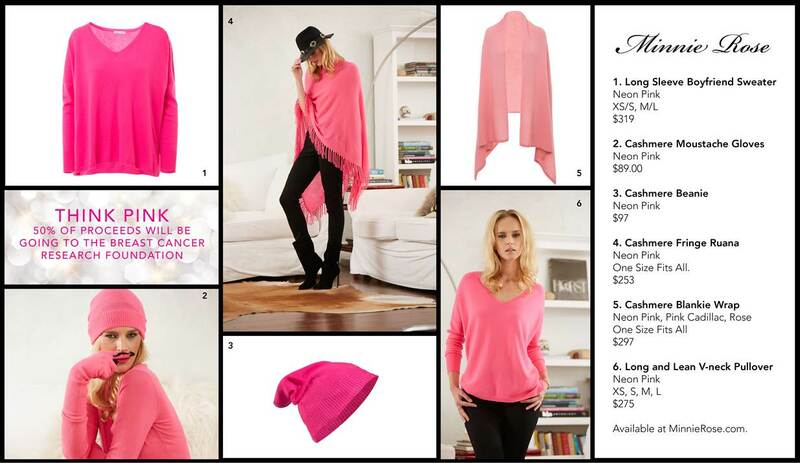 Each October, Breast Cancer Awareness Month brings women from all over the world together in support of a good cause. Minnie Rose, the cashmere brand synonymous with comfort and effortless style, is excited to continue the fight by offering fashions from their "Think Pink" knitwear collection for purchase with 50% of proceeds going to Breast Cancer Research Foundation on minnierose.com. The Breast Cancer Foundation's mission is to provide help and inspire hope to those affected by breast cancer through early detection, education, research and support services. "These days it’s hard to meet someone who hasn’t been affected by breast cancer – whether it’s someone in your family, a colleague, a friend –and I’m proud that we can help further promote awareness to Minnie Rose fans and help give back to finding a cure for a disease that affects so many people”- Lisa Shaller Goldberg, founder and designer of Minnie Rose cashmere. Minnie Rose is a luxurious contemporary collection with a strong focus on wearable, effortlessly chic essentials for a woman’s versatile lifestyle. Designed by Lisa Shaller-Goldberg, the collection offers a head to toe look of beautifully designed classic silhouettes that are trend driven, yet timeless. Coveted by fashion insiders, celebrities and women with an appreciation for style, comfort and craftsmanship, the collection has quickly become one of the best-selling brands at top specialty stores across the country.